I wanted the perfect socks to wear with my favorite boots! 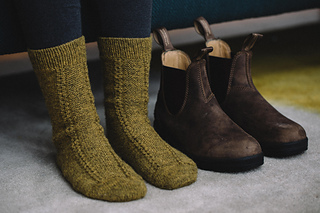 These socks hit just above the ankle, perfect for chelsea style boots. 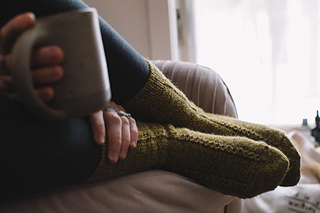 The sweet garter panel framed by honeycomb cables makes for an addictive little knit! 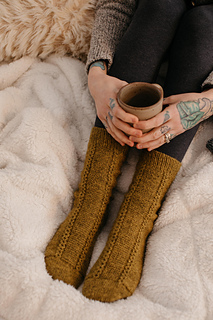 They are my go to travel knit, and I hope you love them just as much as I do! They are worked from the toe up using magic loop. 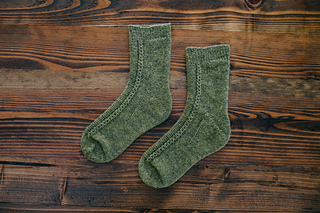 Sample socks are size 2 modeled on an 8.5” circumference foot. Recommended fit is 0.5 to 1”/1 to 2.5 cm of negative ease in circumfer- ence (when measured at the widest part of the foot) and 15% negative ease in length. I found that Tuku Wool knits up heavier then some of the popular, superwash sock yarns. 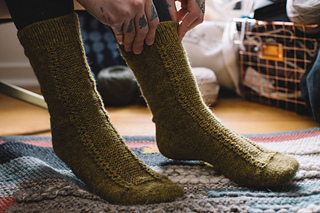 Make sure you can achieve the intended gauge with your yarn of choice before proceeding with the pattern. Opt for heavier fringering weight yarns for the best results. Notions: Removable/clip marker, tapestry needle, scissors, cable needle and a row counter (recommended). Worked over reverse stockinette stitch in the round & blocked. 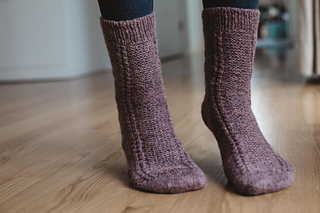 Techniques to Indulge In: Toe up socks, Turkish Cast On, reverse stockinette, honeycomb cables, cabling without a needle, magic loop, tubular bind off, ribbing, and a Fleegle heel! Do you enjoy Andrea’s patterns? 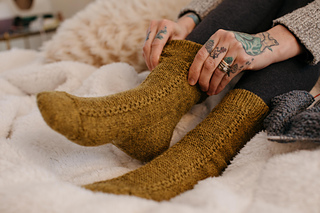 Sign up for the DreaReneeKnit’s weekly newsletter to receive sneak peeks of new patterns, exclusive introductory discounts, video tutorials, and other things she knows you’ll love! !